A potter based out of Dehra Dun, Jayati Mehta is doing some gorgeous crockery and pots that will spruce up your home and garden beautifully. She started pottering around in her studio a few years ago and started selling her products through her exhibitions and website. All her products are lead and cadmium free and non-toxic, including all of the clay, glazes and any paints used for decorating. 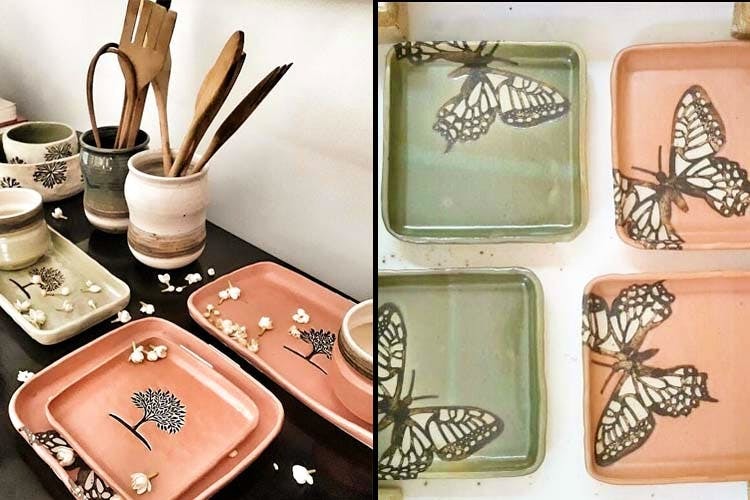 She mostly does utilitarian products, and you can decorate your dining table, kitchen and garden with her plates, jars, pots and glasses. If you’re a sucker for pretty things like us, you’ll be wanting to display her earthy plates at your next dinner party. We love how subtle and minimalistic the designs are, with close ties to nature and a clean aesthetic. . She never mass-produces her products so as to retain individuality, you can view them on her website and get in touch with her via email, or just text her pictures of the design you want and, if it’s in stock, she’ll have it over in a jiffy. She does customisations and it’s just so nice to see the kind of effort she puts into creating everyday objects with such passion. They’re all dishwasher and microwave friendly, and you can bake in them too. If you’ve been hunting for some new crockery that’s unique and aesthetically pleasing, check out her website and Instagram.